Forget about the vegetable lo mein. These aren’t your average Chinese food delivery containers. Our White Paper Chinese Containers with Silver Design are a fun, stylish take on the original that look so good, you’ll want to break out the chopsticks and dig in. Perfect for party favors and promotional gifts, these are casual enough for backyard birthday parties and dashing enough for elegant wedding receptions. Just fill with your favorite candies, homemade baked goods, or other small gifts for a thoughtful favor your guests will love. 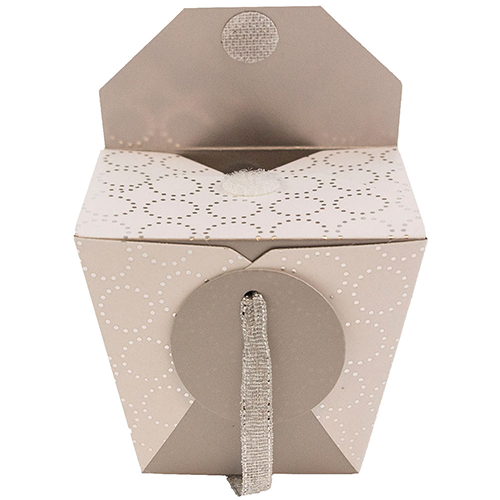 With their swanky white and silver design, these boxes are sure to look great at your event and make a lasting impression on your family, friends, and clients. And since they come with a silver satin ribbon handle, all you need to do is fill them and set them out for your guests to enjoy. They even have a Velcro closure to ensure that your gifts are secure. For your next party, don’t give out another bland gift bag. Spice it up with our stylish Chinese takeout containers. Containers are 2 3/4 x 2 x 2 1/2 and come in a set of 3.